He was the national poet of Finland who wrote in Swedish, and also exercised great influence on Swedish literature. Runeberg's poetry has been compared to that of the great European romantics, such as Hugo, Shelley, Keats, Lermontov and Petöfi. He was the first Finnish writer who achieved a broad national significance. An the small birds' tender bevy? Runeberg was born into a Swedish-speaking family in Pedersöre, on the shores of the Gulf of Bothnia. He studied at the University of Åbo (Turku), and became friends in the 1820s with J.L. Snellman and Zachris Topelius, who gained later fame with historical novels. When his economic situation became difficult, Runeberg took a job as a personal tutor to a family, who lived in Saarijärvi in central Finland. Making acquaintance with the ordinary Finnish-speaking people influenced him deeply, and gave basis for his idealized picture of the rural population. Runeberg's first collection of poems, DIKTER, appeared in 1831 and reflected his love of Finland's landscape and its heroic inhabitants of the backwoods. The poem described the peasant Paavo of Saarijärvi, who repeatedly loses his harvest to the frost, never complaining of his share or rebelling against God. The figure of Paavo became one of of the most enduring icons of Finnishness. Runeberg's breakthrough work was HANNA (1836), a bourgeois Biedermeier idyll in the spirit of J.H. Voss - nowadays nearly forgotten work. However, in a prosaic description "A Few Words about the Nature, Native Character and Way of Life in the Parish of Saarijärvi", Runeberg did not hide the poverty and misery of the inland areas, although he treated the common people with sympathy. In 1837 he was appointed lecturer in classics at the college of Borgå. Next year he founded the Borgå Tidning and worked as its editor. His liberal views and attacks on pietistic narrow-mindedness provoked one of the most important debates about religion of the period. 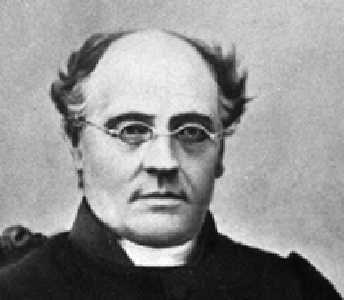 In 1847 Runeberg became rector of the college. During a hunting trip in 1863 Runeberg became paralyzed and the poet was unable to write for the last 13 years of his life. He died on May 6, 1877 in Borgå. The poet's death was the occasion for national mourning. Among Runeberg's best known works are ELGSKYTTARNE (1832, The Elk Hunters), composed in Homeric Hexameters, KUNG FJALAR (1844) and the greatest Finnish classical epic poem FÄNRIK STÅLS SÄGNER (1848-1860, The Tales of Ensign Ståhl). The subject is the war between Sweden and Russia in 1808-1809. The war ended in inglorious defeat, but in Runeberg's hands the war was the stage for ideal patriotism. Runeberg himself never served in any army, but he wanted to examine different human characters against the background of war. The central chracters, from generals like von Döbeln to ordinary soldiers, are treated romantically and and comically by turns. The most memorable is Sven Dufva, a not so bright but brave hero. When the others retreat, Dufva doesn't, and dies in defending a bridge. "Ty visst var tanken" mente man, "hos Dufva knapp till mått, ett dåligt hufvud hade han, men hjertat det var godt." The first poem in Fänrik Ståls Sägner became the Finnish national anthem Vårt Land (Maamme laulu, Our Land). The patriotic heroism of the poems colored Finnish consciousness and attitudes to Russia in the following decades. The relatively harmonious political situation in autonomous Finland as part of the Russian Empire started later to shake, and Runeberg's poems were adopted by promoters of the independence movement. Runeberg's work also served as a cultural weapon in the Civil War (1918) and again in the Second World War. 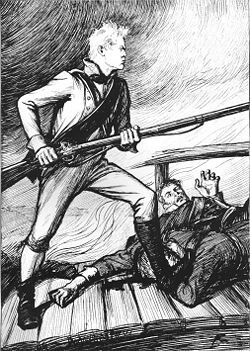 A line from The Tales of Ensign Ståhl, "Let not one devil cross the bridge", became a slogan directed against the Russians. Pioneer of historical novel in Finland in the spirit of Walter Scott, married to national poet Johan Ludvig Runeberg (1831-1877), also assisted his magazine Helsingfors Morgonblad. She started her writing career about the same years as J.L. Runeberg finished his last great works. Frederika Runeberg's Fru Catharina Boije and hennes döttrar (1858) could be called Finland's first historical novel. The story was set during the Great Wrath of 1710-21. Her second historical novel, Sigrid Liljeholm (1862), got bad press from her friend Snellman, and she decided to write no more novels. However, she wrote for the magazines Litteraturblad, Finsk Tidskrift (1877-79), Helsingfors Dagblad, Litteraturbladet, Svenska Familj-Journalen (1872-75, 1877, 1882), Tidskrift fö Hemmet (1860-69).